From Family Computer Magazine 1988 #14 (the July 15th issue) comes Rockman 2 Boss Chara Daiboshuu… the very first Rockman boss robot design contest. Mass Recruiting for Boss Characters!! It is the year 200X. Thanks to the efforts of the super robot “ROCKMAN”, peace has been restored to the world. One year later…… The evil genius scientist Dr. Wily is at it again, this time with a brand new battle to contend with! Just who is he? What secrets is he hiding? It’s sure to keep you guessing all the way to the final stage! And what big bad bosses await there……?! This time, Dr. Wily will be using the fiercest robots designed by you to send up against Rockman!! There will be a total of 8 boss character robots, one at the end of each stage. 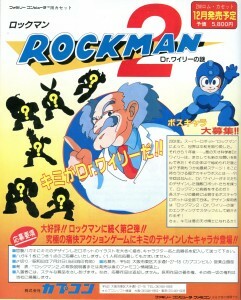 If your design is used, your name will appear in the ending of “ROCKMAN 2 MYSTERY OF DR. WILY”, credited among the staff! So, do you have what it takes to be a genius mad scientist?!! A mega hit!! The sequel to the popular title Rockman!! The character you designed could appear in this ultimate thrilling action game!! Please submit an official postcard with a large illustration of the robot you designed, along with that character’s name and weapon. Entries must be submitted by Showa year 63 on July 31st (postmarked on this date is OK). Winners Announcement: Check the “ROCKMAN 2” instruction manual or other upcoming Famicom news outlets. Winners will receive a mystery dream prize. There will be no further compensation for any submissions. If accepted, the copyright to the submitted work will belong entirely to this corporation. You might have seen this before on Protodude’s Rockman Corner and The Mega Man Network. Digging it up again for Rock’s 25th to celebrate the many boss design contests throughout the franchise that helped shape the series and its fan base. 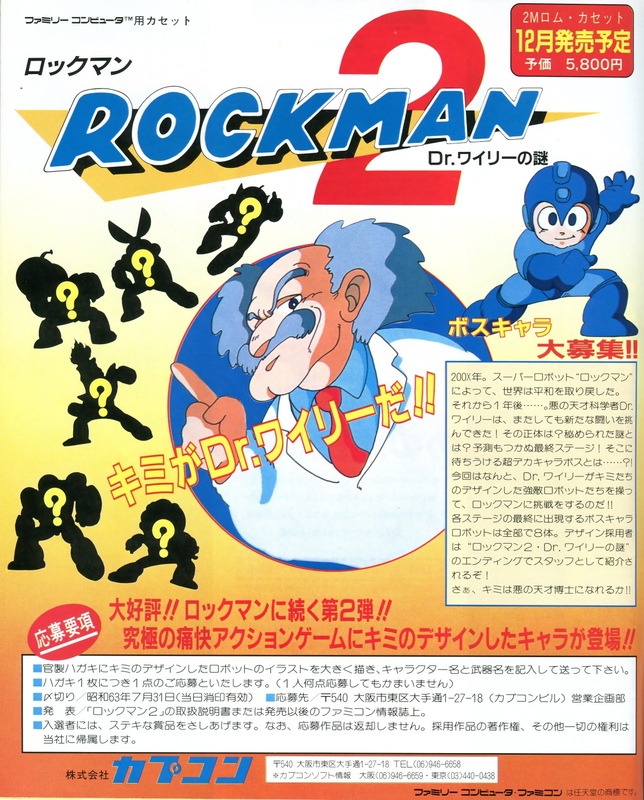 As others have already pointed out, the Rockman 2 logo was an early draft that would later be changed. Boss applications were generally handled by having the game development team design the levels first, then selecting an appropriate boss to match the level’s theme. 8 grand prize winners (later known as the Dr. Wily Prize) and 40 runners up (to later become the Dr. Right Prize) would be recognized for their work. That grand dream prize turned out to be a sweet Rockman 2 “Staff Only” jacket. Ni~ce. 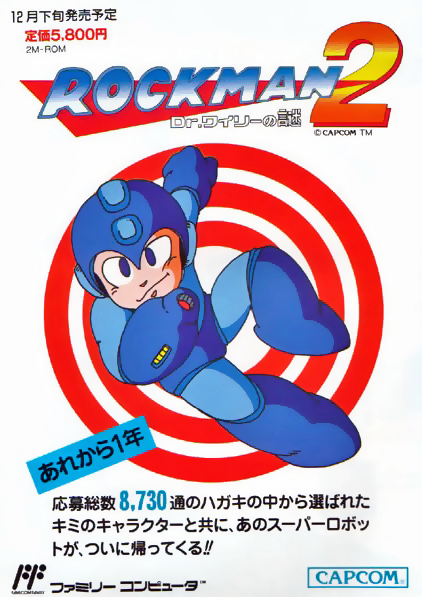 Between the contest announcement above and the below flyer from the Capcom Database, it seems clear that both the plot of Rockman 2 and the actual release of the game are both occurring roughly one year after the first. It’s an important note for Mega Man timeline enthusiasts, and we’ll be examining the early classic games’ timeline in even closer detail a bit later this month. The Super Robot returns at last, along with your characters selected from the total 8,730 postcards!! The poster may say 8,730, but R20 gives a slightly different figure: 8,370 submissions. That’s the number that seems to appear more often, so the larger number may have been a typo… Or, they could have gotten it confused and transposed the number over time. It may have even been an estimate to begin with. I’ll just say either number seems to be in the right ballpark, give or take 400 or so. As the boss design contests became tradition, it was a number that would only grow from there. More Rockman 2, coming up next time. 3 Comments to "Like A Boss"
I can’t wait to see the Rockman timeline, it’ll definitely help me gauge how long it took for various timelines to occur. In the meantime, I finished your request! And it is fantastic! Thank you, LDD! Sacaq on It’s Quint’n Time!